Who Will Win the Eliminator T20 Match, Between SKN vs JAM and Toss Prediction? St Kitts and Nevis Patriots are all set to take on Jamaica Tallawahs on Wednesday, September 12, 2018. In Today’s Dream11 Fantasy Cricket Match of SKN vs JAM Eliminator T20, CPL 2018, we will cover Pitch Report of Providence Stadium, Guyana, Predicted Playing 11, Toss Prediction, Fantasy Cricket News and Tips and Who Will Win? You May Like to Read All CPL Match Prediction. The Eliminator match will be a clash between the third and the fourth position holders. Jamaica Tallawahs finished in the 3rd position with 12 points in their pocket and St Kitts and Nevis Patriots in the 4th position with 11 points in their pocket. Both the teams are equally good and have beaten each other once in this CPL 2018. According to our astrology prediction, JAM will win. The team winning the toss should opt to bowl first as batting first will be a difficult task on this ground. According to our astrology prediction, JAM will win the toss and invite SKN to bat first. Date: The match will be played on the 12th of September 2018 (Wednesday). 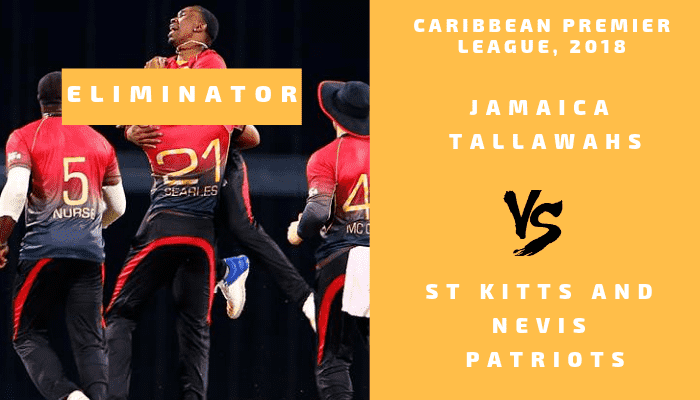 Match: Caribbean Premier League, 2018, JT vs SNP, Eliminator. Time: 10:00 PM GMT, 03:30 AM IST, 06:00 PM LOCAL. If you have been following the Caribbean Premier League, 2018 then you might have a fair idea about this pitch. If you don’t then nothing to worry as I will give a detail pitch report. The pitch of Guyana, Providence Stadium is expected to be a bowling friendly pitch. The fast bowlers will get some extra benefit from the pitch. There is nothing much for the batsmen and the spinners. The seamers will get swing and movement in the initial couple of overs. Isolated T-Storms and Scattered T-Storms is predicted in the first half of the day. In the second half, it will be mostly cloudy and partly cloudy. There is no sign of rain at the time of the play. It is expected to be a hot and humid day. The temperature is expected to be 28-Degree Celsius and the humidity to be 82%, which may rise up to 87%. If we look at the last five matches, St Kitts and Nevis Patriots have won two matches out of five matches and Jamaica Tallawahs has three matches out of five matches. In the last encounter, SKN defeated JAM by 7 wickets with 5 balls remaining. CH Gayle, HE van der Dussen and BCJ Cutting were the key performers of that match. The average first inning score of this ground is 140. The average second inning score of this ground is 57. Highest total on this ground is 191/5 in 20 overs by WI vs ENG. Lowest total on this ground is 68/10 in 16.4 overs by IRE vs WI. Tom Cooper and Mahmudullah left to their respective countries so they will not play. Carlos Brathwaite, Devon Thomas, and Sheldon Cottrell were dropped in the last match. They are most likely to return for today’s match. Tabraiz Shamsi played the last match and he is most likely to retain his place. Alzarri Joseph will lead the bowling department and Chris Gayle will lead the bowling department. Chris Gayle (c), Ben Cutting, Devon Thomas (wk), Anton Devcich, Sheldon Cottrell/Tabraiz Shamsi, Evin Lewis, Brandon King, Rassie van der Dussen, Fabian Allen, Alzarri Joseph, Carlos Brathwaite. Chris Gayle (c), Carlos Brathwaite, Mahmudullah, Anton Devcich, Devon Thomas (wk), Sheldon Cottrell, Ben Cutting, Fabian Allen, Evin Lewis, Brandon King, Ibrahim Khaleel, Shamarh Brooks, Rassie van der Dussen, Jeremiah Louis, Tabraiz Shamsi, Hayden Walsh, Alzarri Joseph, Javelle Glen. Oshane Thomas, Johnson Charles, Rovman Powell, Ross Taylor, David Miller Andre Russell and Glenn Phillips are the key players of Jamaica Tallawahs Team. Andre Russell will lead the Jamaica Tallawahs Team. Glenn Phillips and Johnson Charles will lead the batting department and Oshane Thomas and Ish Sodhi will lead the bowling department. Jamaica Tallawahs Team made a couple of changes in the previous game and they are most likely to play with the same playing 11. Andre Russell (c), Ross Taylor, Colin de Grandhomme, Samuel Badree, Ish Sodhi, David Miller, Glenn Phillips (wk), Steven Jacobs, Oshane Thomas, Johnson Charles, Rovman Powell. Glenn Phillips (wk), Andre Russell (c), Ross Taylor, Steven Taylor, Kemar Roach, Jermaine Blackwood, Samuel Badree, Colin de Grandhomme, David Miller, Johnson Charles (wk), Steven Jacobs, Krishmar Santokie, Andre McCarthy, Ish Sodhi, Oshane Thomas, Kennar Lewis, Rovman Powell, Kirstan Kallicharan, Elmore Hutchinson. Conclusion: This is it for Today’s Dream11 Fantasy Cricket Match Prediction of SKN vs JAM, Eliminator, which will be played on Wednesday, September 12, 2018. We have covered all the details required to win any fantasy leagues. We have covered players recent and past performance, dream11 guru and crictom prediction, all the latest news and updates of St Kitts and Nevis Patriots Team and Jamaica Tallawahs Team, weather report of Guyana, dream 11 best teams, keys players, the best choice for captain and vice-captain, where to watch the live match of SKN vs JAM, Eliminator and the details of live streaming of Caribbean Premier League (CPL), 2018.